An exposed brick accent wall is an amazing feature adding texture and design. The brick wall creates a cozy feel and highlights the history of the building. Brick is ageless and a very popular feature. More and more building owners and designers are exposing the brick walls. 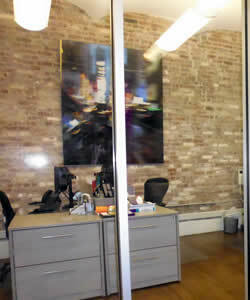 The beauty and allure of an exposed brick wall is subjective and may not appeal to all tenants or buyers. Even with that in mind, the presence of brick is trending and from the looks of it are here to stay. A prevalent feature available in loft spaces around New Year City are exposed brick accent walls in the interior office space. The brick accent walls boost the historical character joining it to the more modern aesthetic. When looking for brick walls starting in the newer buildings or skyscrapers in Midtown might prove to be harder to find than in SoHo or the West Village. Brick was widely used in the pre-war buildings and still common in the loft spaces today. The brick walls are a remnant of an industrial past of the current commercial and residential buildings. Brick interior walls bring raw texture and valuable interest to any space. Exposed brick walls are widely described as timeless and an unconventional addition, to some even an eyesore. Even people who consider exposed brick walls to be an eyesore accept the charming nature and presence it brings to a space. In New York City, exposed brick walls are beloved and in-demand for tenants and buyers alike. The exposed brick aesthetic is an essential component for any search criteria however, brick can have some practical and maintenance concerns. One popular trend of the current real market that seems to be everywhere is the exposed brick accent wall. An exposed brick wall is a visible connection to the history of its industrial past and inspiration for new creativity. The unique touches added by the raw texture of brick is able to suit many design styles including eclectic, contemporary, modern, and even traditional styles. Learning how to maintain and style exposed brick is an amazing way to truly fall in love with the space and its history. Many brick walls are shown as bare or without any hanging d�cor. Perforating or drilling into the brick to place hooks for any hanging d�cor is an intricate process onto itself. There are masonry drill bits, screws, and anchors to make the process simpler and more accessible for design. To further simplify the process, brick clamps are available so renters can hang d�cor without damaging or drilling into the mortar. Hanging mirrors, art, open shelving, and floating shelves are some of the furnishings that compliment the brick well. Other design options, for those unsure about altering the wall, are different brick finishes. Whitewashed, Reclaimed, Stained, Red, or Aged brick finishes are available throughout the city to offer textural and architectural interest. Different brick finishes truly blend and compliment the many styles and designs in the space. The brick can suit and work in support of any design. • Consider coupling furnishings that go well with Brick; such as Mirrors, Art, Open Shelves, and the use of contrasting or even matching Colors. 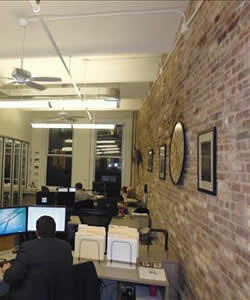 The spaces available today with brick walls are not scarce and found in many New York City neighborhoods. The commercial real estate market is immersed in the exposed brick aesthetic, appreciating the timeless quality and wide spread desirability. If your in the market for an office space that features exposed brick walls - give us a call or fill our of form - we'd be happy to go over the available spaces that meet and or exceed your expectations. We are here to assist and inform in your search for the perfect space to fit your requirements and budget.